Effective body weight analysis for home use. The obesity scale in this article is based on global obesity research, which has uncovered significant health risks for carrying excess weight and / or excess body fat (particularly in the abdomen). To find out whether your body weight and body fat distribution are healthy, go to the articles on body mass index, waist hip ratio, and waist circumference. Take your measurements and then come back to this page for your body weight classification and analysis. 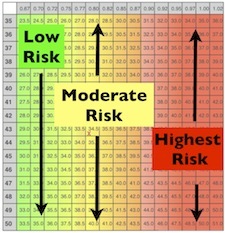 Health risk comparison using the obesity scale. Green is the low risk group, with the lowest risk of premature death from all causes. Yellow is the moderate risk group (overweight), with a 20-30% greater risk of premature death from all causes than those with a healthy body weight. *Studies and reviews show that risk of premature death can be twice as high or greater for morbidly obese people. More info on the obesity scale health statistics. The average person in the U. S. is in the overweight group. If you are overweight, losing about 2-3 inches off your waist and / or losing 25 pounds will put you in one of the healthy weight groups. Scoring red for all tests. BMI above 30, high waist circumference, and high Waist-Hip Ratio. Research on obesity shows that life expectancy may be 6-7 years less for an obese person than for someone who has a healthy weight. * About 1/3 of the US population is in this category. Green for body mass index and yellow or red for waist hip ratio. BMI less than 25, but with a moderate or high waist to hip ratio. Health risks are similar to the Overweight group. People who watch what they eat but do not exercise would likely be in this category. If you have scored in groups 1-3, I would recommend taking the physical fitness tests, starting with the Rockport walking test. * Notice in that article the health benefits of becoming more fit. Next, the article on metabolic equivalent will help you find physical activity that will fit into your busy schedule. *Please get consent from your doctor or health care provider before beginning any new exercise program. Scoring below the green area for all measurements. BMI below 19 and a low waist to hip ratio. For women and men a BMI of 18 has a mildly elevated health risk, even for non-smokers*. If you are in this group and you smoke, your health risks are much higher. As with the 3 previous categories, if your results put you in this group, take the other physical fitness tests and consider making a commitment to consistent exercise and healthy, adequate nutrition. Scoring in the green area for all measurements. Body mass index (BMI) score of 19-24 and normal waist circumference and / or Waist-Hip Ratio. Life expectancy is normal and health risks are relatively low for this group. Increasing your muscle mass may improve your fitness performance, but in terms of general health benefits, this weight category is comparable with the 'Muscular' category below. Scoring yellow or even red for body weight, but green for waist hip ratio. BMI 25 or higher and normal or low Waist-Hip Ratio. Low health risk just like the healthy weight group. Athletes and weightlifters with a lot of lean muscle mass fit in this category. (1) *The health risk percentage values above are not exact, they are meant to give you an idea of how much your health risks may improve as your body weight and measurements improve. (2) The most common causes of death for obese people are: heart disease, stroke, high blood pressure, diabetes, and various forms of cancer. See references 1-4 and 6-8. Return to the top of the article. Return from obesity scale to physical fitness tests.